Review the exhibitor packages, exclusive opportunities, and available discounts below. 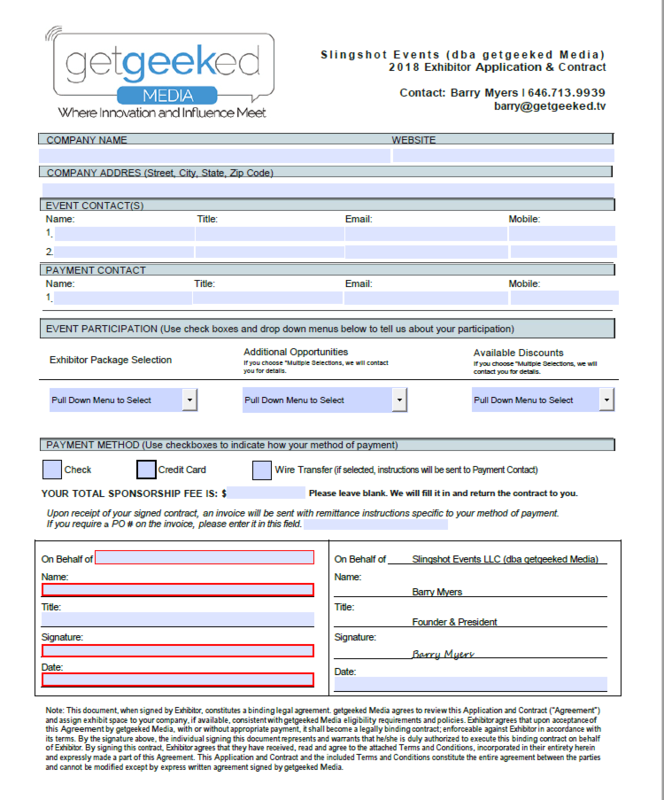 Fill it out our 2018 Exhibitor Contract on your computer, e-sign it, and email it back to us at sponsors@getgeeked.tv. On the contract, you’ll be able to select which event(s) you’re submitting for, what exhibitor package you want, and any discounts that we should apply. As soon as we receive your signed contract, we’ll send you an invoice via Freshbooks that you can pay online. We’ll also send you a link to our unique Exhibitor Promotional Form where you can provide us with all the marketing information we need to promote your participation and get our attendees excited to meet with you at getgeeked! For information on getgeeked Partner Events, click here. To learn how we can help you create a custom event for your next big product launch, click here. *Exhibitors are responsible for scheduling their own press meetings during these times and alerting getgeeked. Click the contract to the left to download a fillable 2018 exhibitor contract. Participation in getgeeked@Night, the official live stream of getgeeked. Video provided after the event. Inclusion in the Official getgeeked “Powered by Geeks” Post Event Buying Guide. “Presented by [YOUR BRAND]” positioning on all print, digital, and online marketing materials. Prices shown are for one event. Discounts are cumulative up to 25%. Multiple event discounts may include partner events and standalone events. Startup pricing cannot be combined with other discounts.